Donaleighs is an Irish pub situated at 28 Dunlop Street, right beside Barrie's historic Five Corners, serving authentic Irish food and beverages, like stouts, lagers, and Irish ales. They serve American, Canadian, and Irish cuisines, offering you plenty of options to choose from. In addition, you also have full bar wine and beverage selection at the pub. You can also find plenty of seating options at Donaleighs, both indoor and outdoor. The seating arrangements include stools at the bar, dining tables in the library area, plenty of booths, and two outdoor patios from where you can enjoy the waterfront view of Kempenfelt Bay. You can either enjoy brunch, lunch, or dinner at the Donaleighs as it remains open seven days a week, from morning till late at night. For those who want to dine in an outdoor seating arrangement, can choose the back patio, surrounded by colourful fencing for privacy, and decorated with mural sets, making the environment romantic and intimating for couples. For the indoor setting, you have an option to choose between the east wing, closer to the pub, or west side, the latest expansion, with more spacious seating for larger gatherings, that also features a full concert stage. The pub allows you to not only enjoy some excellent food, great ambience, but also the live music and entertainment from a great line up of local musicians. Some of their regular artists include Rik Emmett, Memphis Mudd, The High Drive, The Barriers, Dustin Jones, and The Boothill Crooners, all well-known local artists and bands. The interior is eye-catching, with a beautiful stone wall, decorated with paintings and other wall decorations. Other than this, the pub also includes a huge party room for private parties, equipped with custom made wood bar, pub and regular tables, three large-screen LCDs, and private bartender. Donaleighs Irish Public House is among the busiest pubs in Barrie, that was established a decade ago, but later further expanded in 2014 to cater to the rising demand and popularity. Situated right beside the Kempenfelt Bay Lake, and at Dunlop Street, that makes the core Barrie downtown location, it is an easy to access pub with plenty of street parking space available. The place is among the most crowded places in Barrie mostly due to their affordable prices, and friendly customer service that is overwhelmingly praised by diners on review sites. Donaleighs Irish Public House is ranked as the 7th top rated restaurants in Barrie out of 366 restaurants listed on TripAdvisor. Some of their most popular food options include nachos, shepherds pie, brie sandwich, and steaks. 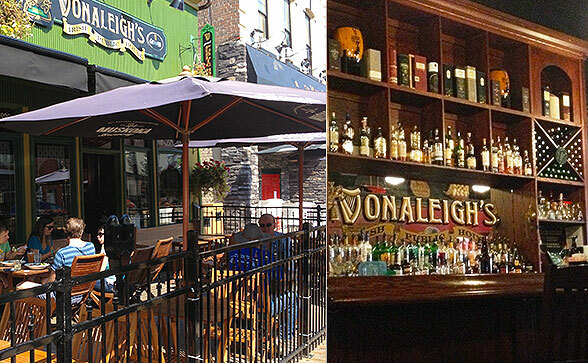 Overall, Donaleighs Irish Public House makes one of the most vibrant places in Barrie for a fun night out with friends.